In East Africa, the 228 IBAs in Ethiopia, Kenya, Tanzania and Uganda capture 97% of the region’s 97 endemic mammals, 90% of 80 globally threatened mammals, and 92% of 131 endemic snakes and amphibians. All Important Bird and Biodiversity Areas (IBAs) are themselves Key Biodiversity Areas, because they are internationally important for birds. Individual IBAs are often important for many other taxonomic groups as well. For example, the network of 228 IBAs in Ethiopia, Kenya, Tanzania and Uganda do an effective job of capturing threatened and endemic terrestrial vertebrates. Collectively, these sites include 97% of the region’s 97 endemic mammals, 90% of 80 globally threatened mammals, and 92% of 131 endemic snakes and amphibians (Brooks et al. 2001). 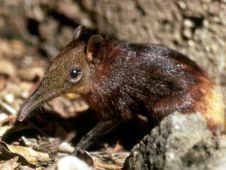 To include the missing species would require only 11 more sites, and this may be an overestimate: several of these species are poorly known and may well be found to occur in the existing IBAs. Similarly, a study in the Eastern Arc mountains and coastal forests of Kenya and Tanzania, a biodiversity ‘hotspot’ (Mittermeier et al. 1998), identified 160 sites, some of them very small, that shelter one or more globally threatened species of mammal, bird, amphibian, gastropod or plant (NatureKenya and WCST 2003). Forty three of these sites (c.25%) had already been identified independently as IBAs. However, the IBA network includes 92% of the 26 most significant sites, those for which ten or more globally threatened species are recorded. All 24 Critically Endangered species (only three of which are birds) occur in at least one IBA. In Uganda, 89% of 2452 species of bird, mammal, butterfly, moth and plants were present in 13 forest IBAs (Pain et al. 2005). Across a wider range of habitats, species records for birds, butterflies, dragonflies, woody plants, large moths and small mammals were compared against 29 of Uganda’s 30 IBAs. More than 70% of butterfly and woody plant species, over 80% of dragonflies, and all but one of the major Ugandan vegetation types were represented in IBAs (Tushabe et al. 2006). Brooks, T., Balmford, A., Burgess, N., Hansen, L. A., Moore, J., Rahbek, C., Williams, P., Bennun, L., Byaruhanga, A., Kasoma, P., Njoroge, P., Pomeroy, D. and Wondafrash, M. (2001) Conservation priorities for birds and biodiversity: do East African Important Bird Areas represent species diversity in other terrestrial vertebrate groups? Ostrich suppl. 15: 3–12. Mittermeier, R. A., Myers, N., Thomsen, J. B., da Fonseca, G. A. B. and Olivieri, S. (1998) Biodiversity hotspots and major tropical wilderness areas: Approaches to setting conservation priorities. Conserv. Biol. 12: 516–520. NatureKenya and Wildlife Conservation Society of Tanzania (2003) Eastern Arc mountains and coastal forests of Kenya and Tanzania biodiversity hotspot: species and sites conservation targets. Unpublished report. Pain, D. J., Fishpool, L., Byaruhang, A., Arinaitwe, J., Balmford, A. (2005) Biodiversity representation in Uganda’s forest IBAs. Biol. Conserv. 125: 133–138. Tushabe, H., Kalema, J., Byaruhanga, A., Asasira, J., Ssegawa, P., Balmford, A., Davenport, T., Fjeldsa, J., Friis, I., Pain, D., Pomeroy, D., Williams, P., Williams, C. (2006) A Nationwide Assessment of the Biodiversity Value of Uganda's Important Bird Areas Network. Conserv. Biol. 20: 85–99.